One year ago today, I created my blog. I know this because I almost forgot to renew my domain. I actually didn't post anything until the next day, because of all the trauma I suffered setting up the blog. I know, it's not that hard. But I had an Ed Plan in school! Anyway- Thanks everyone who made my first year of blogging fun and memorable. Like the time Thom sent me a new pencil or when Quilly let me have her old sharkskin suit! Oh and that time Susan sent me a napkin from Ireland! You guys have really made my first year of blogging something to cherish! To commemorate this monumental occasion, I would like to share some CAKE with everyone! Everyone, enjoy the CAKE, just don't get buttah on your tie! Woohoo! One year old! Happy birthday! Congratulations!!! Well done...Hope I can eventually do as well as you. Hey! At least you DID remember yours! My blog is 5 or 6 years old (yea... I don't even know) and I have YET to remember to celebrate it even ONCE! LOL! Happy Bloggaversary Tilden! Everyone thanks for wishing me a happy Blog-o-versary! Did you enjoy your CAKE? 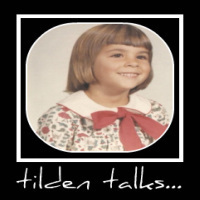 Happy Blogoversary, Tilden! I came from Quilly's blog and enjoyed the cake ;).